Zelda seems less perturbed by the cold weather. 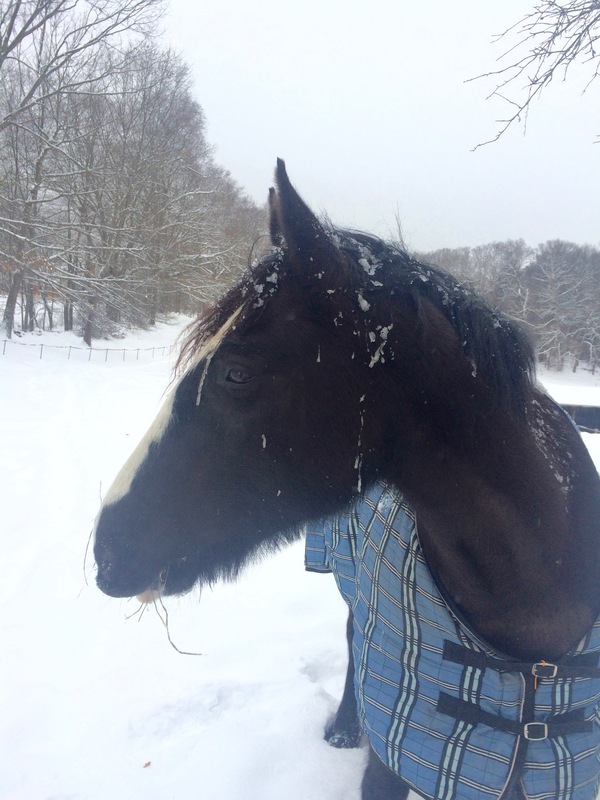 Even the icicles hanging from her mane don’t bother her. I am in awe of my friends who have kept up their riding this winter. I see photos of them in the snow and I shiver — it’s hard for me to ride when it’s less than 20 degrees so instead, I’ve been hibernating in front of the fireplace and dreaming of spring. Or maybe of going south for the winter. It’s all those darned Facebook pictures of people having fun in Aiken that are getting to me! I’ve looked for my motivation. It’s not hiding under the blankets at the barn . . . or in the tack room. I’m hoping that I can find it in time to get at least one ride in the new snow that fell this weekend before it gets ruined with rain. And I’m going to track down some indoor space that I can rent from a local barn so that I can start getting my mojo back. And get my horses back in shape. The horses don’t mind. They are tucked up in their blankets but out 24/7. Icicles drip from their manes and while they’ve spent some time in their run in sheds when it’s windy, for the most part they are enjoying the snow. Anyone else need to get back in the saddle? Its been so wet here in CA. Talked to a friend in MD who told me to ride down my driveway, that’s tuff. but what she did. its just wet here and provides no interest in riding! I’m on your page and have the same dreams!